Find out the best places to dive Cyprus here. Order FREE scuba diving brochures to find a reputable dive company in Cyprus. If you love scuba diving, Cyprus is an ideal choice, whether you are relatively new to the sport or an experienced diver. The whole of the south coast offers opportunities to enjoy a fabulous Cyprus diving holiday, from Larnaca in the east to Latchi in the west. There are numerous dive companies across the island, all offering a variety of diving packages and covering both PADI and BSAC courses. If you are a total beginner and haven't a clue what PADI or BSAC mean, don't panic. Most dive companies offer complete beginner packages which start you off in a pool or shallow water on what is called a try dive. If you like it, you can then decide whether a full course is for you. Tip: Order FREE scuba diving brochures to find a reputable dive company in Cyprus. Akamas peninsula - This gorgeous unspoilt area on the west of the island is close to Latchi and is perfect for beginners and experienced divers to dive Cyprus. There are numerous Cyprus dive sites dotted along the peninsula although there are no diving wrecks to explore here. Visibility, however, is excellent at thirty metres plus and there are numerous artefects from bygone times on the seabed. St Georges Island is the best known dive site for experienced divers, offering a wall dive with a sudden drop off. It is THE place to see a large variety of marine diving life such as grouper, octopus and sea bass. Coral Bay - Close to Paphos, this area offers plenty of quiet coves and as the location is close to a variety of restaurants, bars and varied nightlife, it is also perfect for a family holiday. Zenobia wreck near Larnaca. Although some people would consider the Cyprus sea to be a little basic for exciting diving, there is no doubt that the Zenobia is one of the best sites for diving wrecks in the world. With the top of the former ten thousand ton ferry only sixteen metres down, visibility in clear waters is usually excellent. You need several dives to even begin to experience the wonders of the Zenobia, which sank during its maiden voyage in 1980 taking all 104 articulatedlorries with it! The wreck, forty two metres down to the seabed, is such a draw for Cyprus diving, scuba companies from the west of the island will even transport you to Larnaca in the east to see the wonders of the Zenobia for yourself. The Dive Site Directory offers additional information about sites to dive Cyprus. 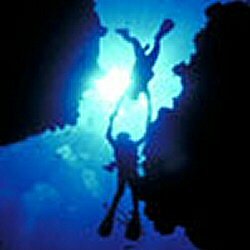 You can get hold of FREE diving brochures for recommended dive companies here. Right on our doorstep, we have Crystal Marine and Latchi Waterports, both based on Latchi harbour. Why not dive the Zenobia and combine your diving with a Cyprus sailing holiday too or other watersports activities? Our friends at Latchi Watersports and Crystal Marine in Latchi offer a whole package of RYA courses and various watersports activities between them and come highly recommended by us as we have done some of their courses ourselves!